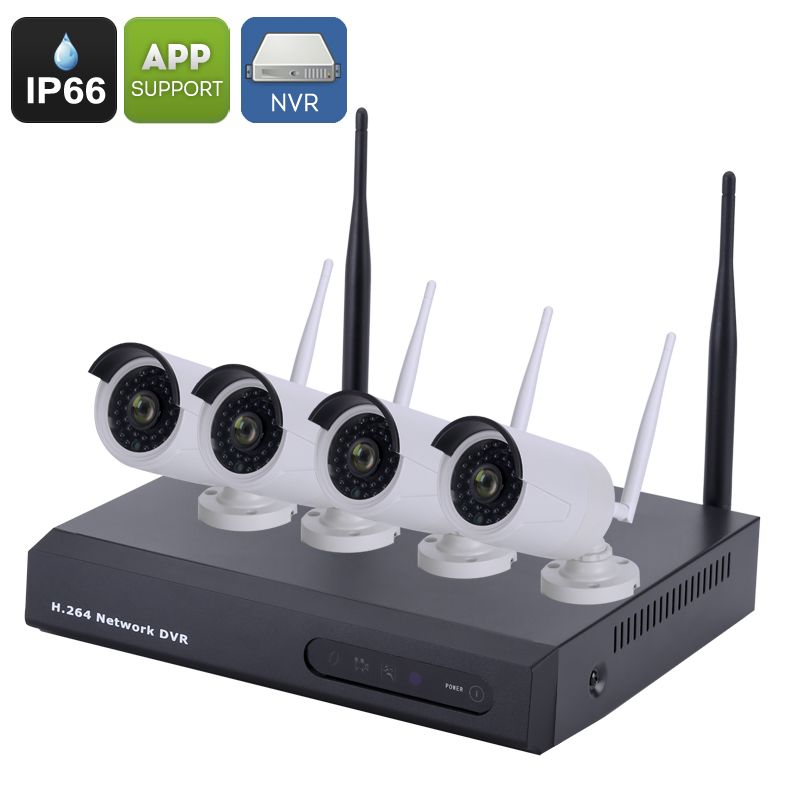 Successfully Added 4 Channel Wireless NVR Kit- 720P Cameras, IP66, 1/4 Inch CMOS, ONVIF 2.0, iOS + Android APP, 4TB HDD Support to your Shopping Cart. IR Cut and night vision brings 254 x 7 security so your always protected. Experience professional surveillance video that leaves nothing out with this 4 channel DVR Kit that captures and records 720P video for superior picture quality that captures every detail. Each of the 4 cameras are equipped with a 3.6mm lens that can cover a 76 degree view so you need fewer cameras to cover your full property. Thanks to Wi-Fi connectivity this NVR kit is easy to setup as the cameras just need a simple power supply so cabling is kept to a minimum. With an IP66 rating the cameras are well protected from the elements and can be used indoors or out. Each camera features a whopping 36 IR LEDs that are automatically activated by the IR cut when ambient light levels fall to low. All of these features means you can set the cameras up wherever you like and enjoy 24x7 security so you're always just a few clicks away from checking in on your home or business. When it comes to storing the recorded data you can add up to 4TB or storage via the NVRs SATA port and as this surveillance systems adopts H.264 compression meaning the recorded data takes up less space without compromising the quality of your footage. This 4 Channel NVR Kit with IP cameras comes with a 12 months warranty, brought to you by the leader in electronic devices as well as wholesale security systems..